It had been about a year since my last sneaker purchase. The Adidas AdiZero Feather didn’t fare well in the Taiwanese pollution, so I basically stopped wearing them. Also, they had developed a tear, which made them unsuitable for daily wear. I had gotten back some very old Converse One Star, that I had gotten out of storage last summer, which I had initially bought in Québec about 10 years ago. Since I had been very careful with them, they were still in good shape, albeit for a slight yellowing of the sole. I came home at about 22:30 and on the ride, I wondered what I’d do. 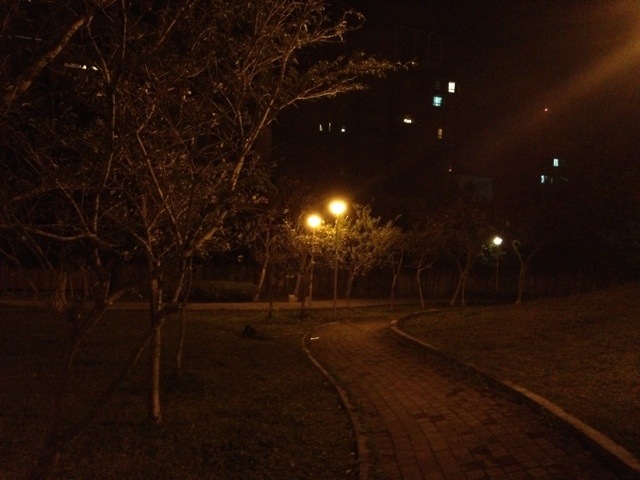 When I came home, I decided that I would skip working late and go out for a run. Once I was out, I immediately felt last night’s run in my legs. That’s to be expected. It also was harder than before, and took more effort to keep going. I was hoping to improve my slow pace from yesterday, but I managed to run the same distance in almost exactly the same time. I ran 4 km in 33:31. My average pace was 8:10min/km. Highest BPM was 193 and my average was 157. I have been taking a lot more photos when I’m around with my iPhone. Most of these are taken with Instagram (djrange) but sometimes I use the iPhone 4S’s camera directly, which isn’t have bad.